For the past three days, Draikessa the Eventide Draik and her friend Kayennah the Pirate Krawk had spent the majority of their time seeking out the Baby Bruce known as Boochi. Draikessa was determined to discover if there was any truth behind the myth that Boochi randomly zapped Neopians in Baby neopets, and if so, why? After a chance encounter with a sobbing Boochi three days earlier (an encounter in which had NOT resulted in anyone being zapped Baby, Draikessa regularly reminded her friend), Draikessa was convinced that the Boochi myth was just that: a myth; or that Boochi actually need their help. Neopets has been around for a long time, since 1999 to be exact. A lot has changed, some things have stayed the same, some things have revamped and others have all but disappeared. Let us take a stroll down memory lane for the old timers and uncover some interesting history for the newbies. With another Usul Skiing Season rapidly approaching, now is a great time to remember and appreciate Terror Mountain’s most exciting sporting event – Alpine Speed Racing. Many Usuls from all over Neopia have travelled to stay in Happy Valley lodges each winter for as long as snow has graced those iconic slopes. I have been a part of the Neopets community for as long as I can remember. When I first signed up, I was a teenager just gaining access to the glorious thing that people can’t live without these days, the internet. I remember joining, because I thought the concept of caring for a virtual pet was cute and would give me something to do in my spare time. Over fifteen years have gone by since then. Masses of Neopians huddled in the streets; some fearful, some bitter and resigned. Some petpets stayed close to their owners, snapping at the pink beasts which kept the groups in line, others stuck close to their owners for some sort of comfort. Around the group, dozens of Meepits in all sorts of colors herded the Neopians into small groups, their expressions dull and exhausted, many longing to return to the luxury of a quiet Neohome and the comforting yet boring discussion of evil plots that seemed too ridiculous to ever pass. Who would have thought that the Meepits would have won? (Whoever called ruling the world glamorous is a liar.) The invasion had happened so fast, it almost felt like a dream - the kind that's disjointed, and leave you only half-remembering shadowy visions and bright lights. It started with a call to unite, swaying other petpets who felt mistreated or neglected to a united cause. They had to keep it subtle; they couldn't have had the Sway find out about their plan, not after the last time. They started by discreetly disposing of any great leaders they could, as fast as possible before anyone found out. By the time they had managed to finally track down capture the Duchess, Neopia had fallen into panic with no one to lead them. It's surprisingly easy to take charge over a world of hysterics, but far harder to keep order. No one kept track of who fell in the first few days. 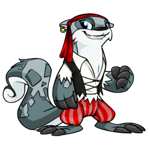 Most petpets who joined the cause of the Meepits defected back to their Neopet owners, whether it be due to regret, fear, or a simple desire to avoid the blame. But eventually, things were sorted out somewhat, and most of the fiercest rebels had been put out of commission. Yes, the Meepits had won, and now ruled over Neopia with iron paws. So... why weren't they happy? Within a somewhat worn-down home in Neopia Central, a Jelly Meepit practically squished her face against the slightly cracked glass of the window, internally thanking herself for not signing up for the Meepit-Neopian Order Unit. Behind her, a Starry Meepit rummaged through a toppled drawer, stressed as could be. Alabaster watched the stone doorway intently from around the corner. He could smell the tasty aroma of the Breakfast Croissant wafting out of the shop. His stomach growled at the thought of a piece of Real Cheese Cheesecake. Alabaster licked his lips when he heard the sound of a can of fizzling Elderberry Achyfi being poured. This was practically a form of torture. The shadow of the shopkeeper danced along the ground as the owner danced around inside the shop, showing off his edible wares to paying customers. Alabaster started to lose hope that there would be anything left over. He couldn’t give up, though. It was already midmorning and all of the other shops would have been claimed by others for the day. Alabaster strengthened his resolve and continued to wait. His renewed determination kept him intently following the shopkeeper’s shadow for all of about five seconds. There’s got to be a better way, Alabaster thought to himself. He was getting frustrated with this lifestyle and needed a solution. Just as he started to turn away from the shop, the yellow chia stepped outside with some leftover food bits from the morning rush. He walked over to the dumpster and tossed them in. Alabaster impatiently moved forward, ready to pounce on the food as soon as the chia left. He must have made too much noise, though, because the shopkeeper turned around and spotted Alabaster sitting at the edge of the shop wall, waiting. “Shoo! Shoo, you kiddie kad! Get out of here!” Alabaster turned and fled the area as the yellow chia chased him, shooing him away with a dirty washrag. Alabaster ran as far as he could before he had to stop and catch his breath. He looked around to see how far he had run. The money tree was to his left, most likely filled with tons of delicious fresh foods just waiting to be snatched up and eaten. Alabaster continued past it, though, since he wasn’t allowed inside. Straight ahead he found the petpet shop. Perhaps he could convince the shop owner to sell him to a loving family that would take care of him. He walked up to the shop, cracked open the front door, and peeked his head inside. A motherly looking usul turned her attention away from a giggling eizzil and looked toward the door when she heard the bell jingle. Her smile faded when she noticed Alabaster sitting warily at the bottom of the recently opened door. Warm Up With Neopia's Best Soup. Wait, Wait, Wait. Let me stop you right there. WHERE did these Pants come from!? Do you know how much energy it takes to deal with twenty pets? Sam came to slowly, dragging himself into a foggy, pain filled consciousness. His head throbbed, a dull ache radiating out from the base of his skull. His arms hurt when he tried to move them, aching from being tied too tightly behind his back for too long.